We LOVE alignment at Omega Movement because it is the core of wellbeing. Alignment is more than posture as you know that good alignment makes you feel better in mind, body and energy. We wanted to share two of our most common approaches to working with posture for alignment. Physical alignment is not as easy to perfect as you might think - it takes awareness, conscious action and deliberate retraining to realign your posture. Depending on what you do with your day-to-day life your posture will waiver. For example, after years of training in Pilates Nid has fairly neutral posture when assessed in a static analysis. However, if she cycles a lot for a week her shoulders will round forward a bit more, palms turn inwards further than normal and hips be more closed. If she spends a week doing yoga the opposite happens to her posture. ‘Neutral’ posture is the most efficient for your body. It is the alignment that your physical body has developed over millions of years. The overall rule is a plumb line from the middle of your head, through the back vertebral bodies of your neck, through the centre of your thorax, through the top of the iliac crest, centre of the knee joint and ankle bones into the ground. The natural ‘S’ curve of the spine created in this alignment is fabulous for shock absorption, and mobile and dynamic for responsiveness. When the body is aligned the muscles work less so there is less tension in your muscles and your body feels more ease and stable. You have buoyancy whilst feeling charged with energy from the ground. This alignment then stays as you move the body in its surroundings. For example, the shoulder is stacked over elbow and wrist when weight bearing on the arms. The knees follow the middle toe when bending to allow a clean line of energy from the ground into your pelvic floor that activates the abdomen for more strength and support into the upper body. The body parts move in response to another moving. It is a chain of reactions that should respond appropriately to other body parts. If one part over-exaggerates then the chain is affected and less efficient. 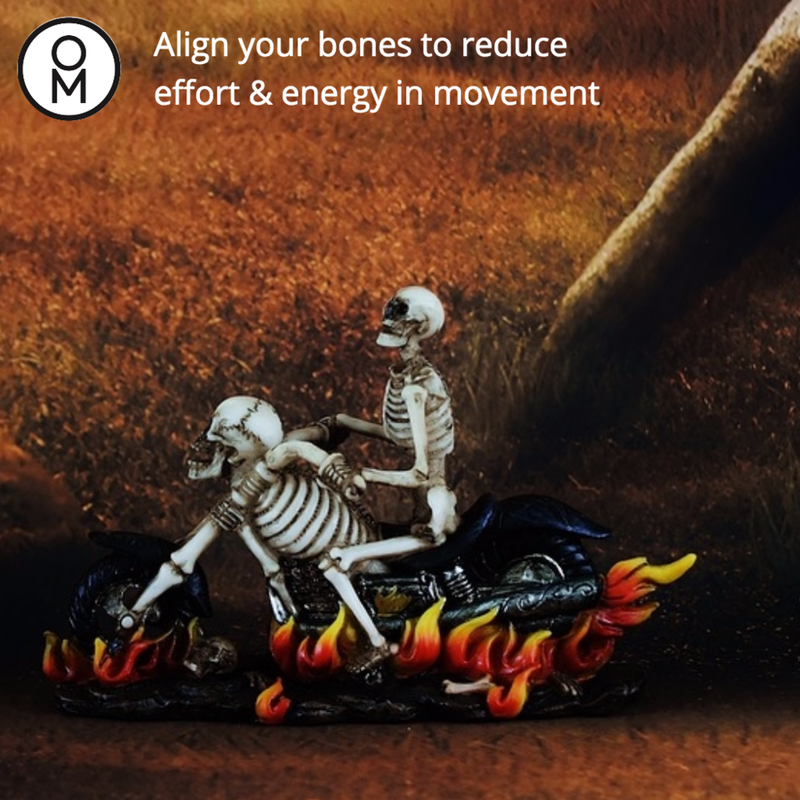 You need to move proportionately with a smooth gliding of the joints and muscles to know it is all efficient. An easy way to see balanced alignment is whether there are awkward edges or rounding in the shape, especially near joints. That the breath could flow easily through it without any congestion or getting lost in the space. This workout is great for centering your movements in an aligned fluidity. Make sure you have a foam roller as long as your spine! This bring us to energy in alignment. In yoga, breath is the life force or prana. Prana should move freely and easily around the body in all your shapes. This creates the most efficient flow of energy transfer throughout your body. Now we are in the realm of physics – where is the load, what part is the foundation for the load, and what part is moving the load. The biomechanics of aligned movement is supported fully by breath – often an inhale to open and pause and exhale to close and do effortful movement (or relax). The air in breath can create power into the movement, a force of energy that you can use to maximise efficiency. Favoured by our workplace wellbeing clients, this workshop focuses on a specific part of posture or the overall principles. Workplace wellbeing varies depending on the type of business and roles for the participants. We tailor this in our workshops to be relevant to the client. The concept is an explanation about the anatomy of neutral alignment with one of osteopaths. With a Pilates instructor they guide the group through in pairs to test and review each other’s alignment. Then the Pilates instructor demonstrates some exercises for the different posture habits and how they can be improved. This is a fun, interactive and informative workshop. Contact us for more information about our workplace wellbeing workshops. The connection of mind, body and spirit are all displayed in your physical body. How you hold yourself, the sensations and movement patterns reflect all aspects of who you are. This workshop takes you through an awakening exploration of how your biomechanics express your subtle energy body. Great for those with more of a background in movement this workshop is an enjoyable exploration of deepening your inner connection. The structure of the workshop will move from knowing what 'neutral' posture is in your body. How as you move away from this 'centre' it reflects your energetic alignment in your biomechanics. From sensation work, through use of the breath, you can alter the energy and your biomechanics together, and shift back into a larger alignment towards your inner Self. 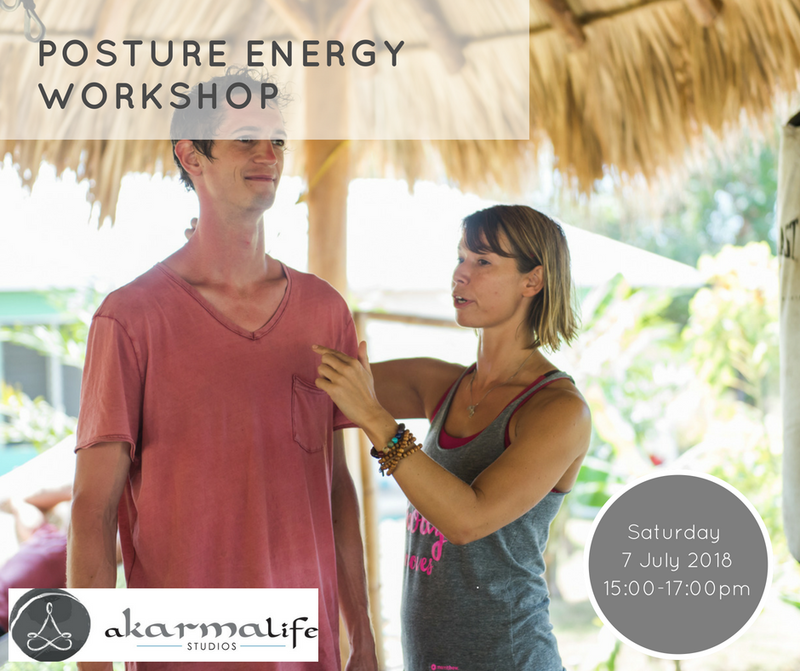 Often a favourite workshop on our retreats with Nid, the next public workshop is at Akarmalife Studios on Saturday 7 July 2018 at 3pm.